Sharda Peeth Corridor will be the second corridor to be established after the Kartarpur Corridor which provides access to Gurudwara Darbar Sahib at Kartarpur in Pakistan. Sharda Peeth is an abandoned Hindu temple and an ancient centre of learning in Pakistan occupied Kashmir (PoK). The temple is dedicated to Goddess Sharada, the Hindu Goddess of learning. Sharada Temple is located at Sharada village and it is here that river Kishanganga and two streams Madhmati and Sargun meets. Goddess Sharada is the 'Kuldevi' of Kashmiri pandits. 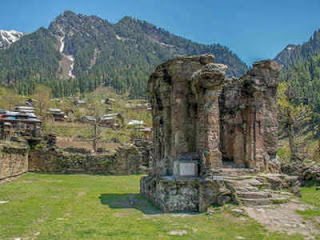 It is also one of the three famous tirthas, or holy sites, for Kashmiri Pandits, the other two being the Martand Sun Temple and the Amarnath Temple. Sharada Peeth is also revered as one of 18 Maha Shakti Peethas, or "Grand Shakti Peethas" which commemorates the location of fallen body parts of the Hindu Goddess Sati. Sharada Peeth is believed to be a foremost centre of learning Between the 6th and 12th centuries CE hosting scholars such as Kalhana, Adi Shankaracharya, Vairostana, Kumarajiva, and Thonmi Sambhota. The temple is about 130 Km from Srinagar and 150 km from Muzaffarabad, the capital of PoK which is currently under the control of Pakistan. Q. Pakistan government has approved a proposal to establish which corridor that would allow Hindu pilgrims from India to visit a temple in the region of Pakistan occupied Kashmir (PoK)?